Shoba Narayan's memoir of creating a new life in Bangalore after two decades in the US centers on an unlikely friendship with her milk lady and their quest to buy a cow. With the many types of memoirs proliferating in India these days, the themes that remain most popular are: Bollywood, cricket, and politics. Of course, this trend reflects the country's three main obsessions. So, when a personal memoir like this one comes along, and it eschews high drama for gentle humor, dives deep into socio-cultural history, and presents slices of contemporary life as constant sources of everyday wonder, it's a refreshing welcome. "A good memoir requires two elements—one of art, the other of craft. The first is integrity of intention... Memoir is how we try to make sense of who we are, who we once were, and what values and heritage shaped us. If a writer seriously embarks on that quest, readers will be nourished by the journey, bringing along many associations with quests of their own. The other element is carpentry. Good memoirs are a careful act of construction. We like to think that an interesting life will simply fall into place on the page. It won't... Memoir writers must manufacture a text, imposing narrative order on a jumble of half-remembered events." With this memoir, Shoba Narayan's integrity of intention shines through so clearly and beautifully that it's all too easy to take this journey with her as she describes her life in Bengaluru (as Bangalore is now called) after having spent two decades or so in the US. This is not her first such personal and insightful account. Her 2012 memoir, Return to India (Jasmin, 2012), described her journey from India to America, her life as an immigrant, and her eventual return to India as a wife and a mother of two. "Home" is an ongoing and complex colloquy with oneself for those of us who have lived through such immigrant odysseys. In The Milk Lady of Bangalore, Narayan gives us more of how she continues to navigate and negotiate those endless terrains of personal identity, familial belonging, and social community to assimilate on her own terms. Much of the book is centered on Narayan's friendship with the eponymous milk lady. Sarala sells milk fresh from her cows to those who have still not succumbed to the packaged varieties. It is an unlikely relationship as both women are from different classes and castes within their society. Like most women of her age and class in India, Narayan would probably not have even formed such a close bond with Sarala had it not been for those decades of different life experiences outside of India. Despite all the inequalities, they share a lovely rapport from the start and Narayan gives us a charming, yet well-rounded, portrait of this everywoman in a style that is reminiscent of R K Narayan. Both Sarala's livelihood and her life as one of the urban poor bring Narayan closer to cows than she has ever been. They send her researching the history, literature, biology, mythology, and evolution of this most sacred and revered beings in India. Along the way, there are some interesting experiences involving jaunts deep into villages where the pastoral delights make it seem as if time has stood still for at least half a century. Contextual childhood memories of religious traditions, patriarchal beliefs, and ancient rituals are presented with a studied lightness that avoids flowery nostalgia for cool-headed insights — which, as they are informed by global perspectives, are more than mere backward glances. There are new discoveries of how all aspects of the cow — from its life-giving milk to its life-saving excreta to its benevolent presence — are woven tight throughout modern Indian life much like in ancient times. The big adventure of the book is when Narayan decides to buy Sarala a cow. This, it turns out, is no simple transaction. There's much to be considered and plenty of advice to be parsed through. Narayan does her due diligence, of course, with the help of Sarala and Sarala's network of family and friends. As with all good dramas, there's a twist at the end which I will not give away except for this: if you take this entire journey with Narayan in earnest, you might need a tissue handy. A couple of things might have made this story better. For example, while there's still plenty here to draw the Indian reader already familiar with the intricate religious and historical connotations of the cow in our culture, there is, unfortunately, not enough deep-diving into the darker aspects of the cow's role in India's murderous identity politics today. Perhaps this is Narayan's own reticence toward anything too controversial, or her editor's advice to ensure a certain market/genre positioning. Whatever the case, their mutual pact to maintain a lighter-toned narrative short-changes the reader from getting a fuller picture of the many contradictions and dichotomies that the cow represents in India today. Also, at various points in the story, I found myself wanting to know more about some of the other cow industry experts Narayan mentioned, rather fleetingly, consulting in her own educational journey. There's a source list at the end of the book but that's not quite the same, of course. 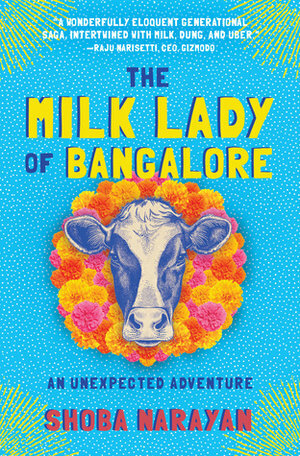 Overall, The Milk Lady of Bangalore is a compelling, different take on a prominent and vastly popular subject: the place of the cow in Indian culture. Narayan's skill at braiding different threads together renders a smooth storytelling approach. Her anecdotes, whether funny or serious, are never rambling or tangential. All the different characters are painted with unique brushstrokes to make them instantly memorable. If we return to Zinsser's second necessary memoir element from earlier, Narayan's carefully constructed narrative certainly showcases her love for and attention to her subjects here. Her raconteuring language is like that of an old friend — warm and nourishing even when recounting the unpleasant. At one point in the story, as the two women are discussing how to choose a cow, Sarala puts forth her usual intuitive or street wisdom and Narayan writes: "What Sarala says is music to my ears. Sychronicity. Serendipity. Destiny. Nebulous intangibles that speak to my soul and spirit." It is all of these wonderful things that Narayan conveys in this book, along with several generous side servings of history, literature, science, and mythology.